its body to pump up its counter� strike. its tail. When that happens, the POK�MON will try to take the foe with it using DESTINY BOND. 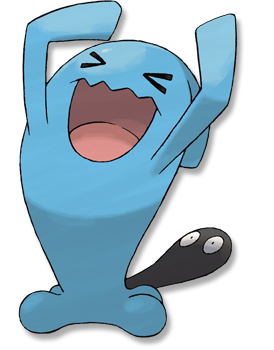 Emerald Usually docile, a WOBBUFFET strikes back ferociously if its black tail is attacked. It makes its lair in caves where it waits for nightfall. Leaf Green It hates light and shock. If attacked, it inflates its body to pump up its counterstrike. Diamond/Pearl It desperately tries to keep its black tail hidden. It is said to be proof the tail hides a secret. Platinum It desperately tries to keep its black tail hidden. It is said to be proof the tail hides a secret. Heart Gold It hates light and shock. If attacked, it inflates its body to build up its counterstrike. Soul Silver To keep its pitch-black tail hidden, it lives quietly in the darkness. It is never first to attack. Black It desperately tries to keep its black tail hidden. It is said to be proof the tail hides a secret. White It desperately tries to keep its black tail hidden. It is said to be proof the tail hides a secret.